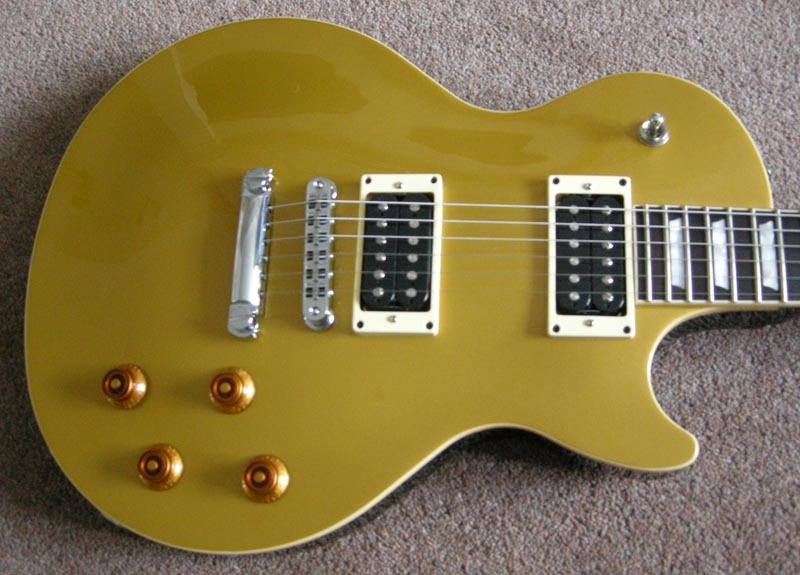 Stormshadow Guitarworks khamsin KS0003 in Goldtop. 1pc Mahogany Body, Maple Top, TonePros Locking TOM & Stoptail, Kluson/TonePros Locking Tuners, Body & Neck Binding, Stormshadow Khamsin Custom Wound Pickups. I recently purchased this guitar from Mor Music in York. The owner, Phil, is a top class guy who knows his stuff. I'd recommend calling in & checking out what they have. As soon as I picked up the Khamsin and placed it on my lap I felt a connection - wierd I know. As soon as I started to play it I realised that I had stumbled across something special. The Khamsin is so well balanced. When playing a note or a chord the whole guitar seemed to resonate through my body. I had never felt that before in a guitar. I play live through a Marshall TSL60 stack and the Khamsin sounds awesome through it. Crystal clear on the clean channel with plenty of depth. Kick in the overdrive channel and, wow, singing sustain & growl to die for. I own several guitars one of which is a black Gibson Les Paul 25/50 Anniversary and I never thought I'd say this but the Khamsin is streets ahead. My only regret is that it's taken me far too long to come across a guitar of such awesomeness (if that's a word....) & a skilled craftsman who really cares about getting things right & providing his customers with an excellent after sales service. A massive well done & thanks to Rich at Stormshadow.